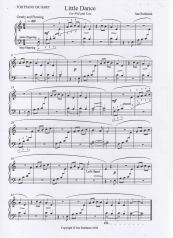 A beginner's piece playable on piano, lever or concert harp and dedicated to Sue's children. Available free on request with any order. A piece of intermediate difficulty. Dedicated to a former pupil in celebration of her confirmation. A solo for advanced piano. Written in memory of a family member who bravely battled for many years with ALS. Just before Christmas a few weeks before she died, her twin sister took her to look at all the pretty lights. 50% of proceeds from this piece will go to charity.